Whether you are an outfitter or just a lover of wall tent camping, you will be hard pressed to find a wood burning stove that has the value added features of the Alpine Heavy Duty Cylinder Stove. There is no fiddling around after the purchase trying to find a damper, internal log grate, spark arrestor, or accessory shelves. These items in addition to a five piece nesting pipe are included with our Alpine Stove package. Each component is designed to fit inside the stove, along with the removable legs, for easy storage and transport. We have even drilled the hole for you for installing your pipe damper. A roomy cook top and door damper makes it easy to control the heat for cooking chores. If you need more hot water the stove has been designed to take a standard wood stove water heater and it will also nest inside. Enjoy a cup of hot chocolate as the sunrises on the campsite or serve hot apple cider at the next thanksgiving celebration. This 20 quart Hot Pot will serve up to 80 servings of these delicious hot drinks making it perfect for any activity. The spigot style valve is quick and easy to use which also makes it great for washing dishes, food prep and hygiene needs in the outdoors. A tasty treat is only minutes away with the Pocket Puff. Simply mix your favorite ingredients, pour and heat. A delicious cinnamon sugar puff or s'more dessert can be enjoyed by everyone. When you want more try a strawberry hazelnut puff with fresh fruit and your favorite spread. With a little bit of creativity the options are almost endless. From sunrise to sunset, the Pocket Puff simply cooks a warm meal for any time of day. For breakfast, enjoy a delicious omelet with all your favorite meats and veggies. If that is not enough try blueberry pancakes or buttermilk biscuits. Corn bread or appetizing pizza puffs make for tasty dinner options. The possibilities go as far as your imagination will take it. Alpine Heavy Duty Cylinder Stove Whether you are an outfitter or just a lover of wall tent camping, you will be hard pressed to find a wood burning stove that has the value added features of the Alpine Heavy Duty Cylinder Stove. There is no fiddling around after the purchase trying to find a damper, internal log grate, spark arrestor, or accessory shelves. 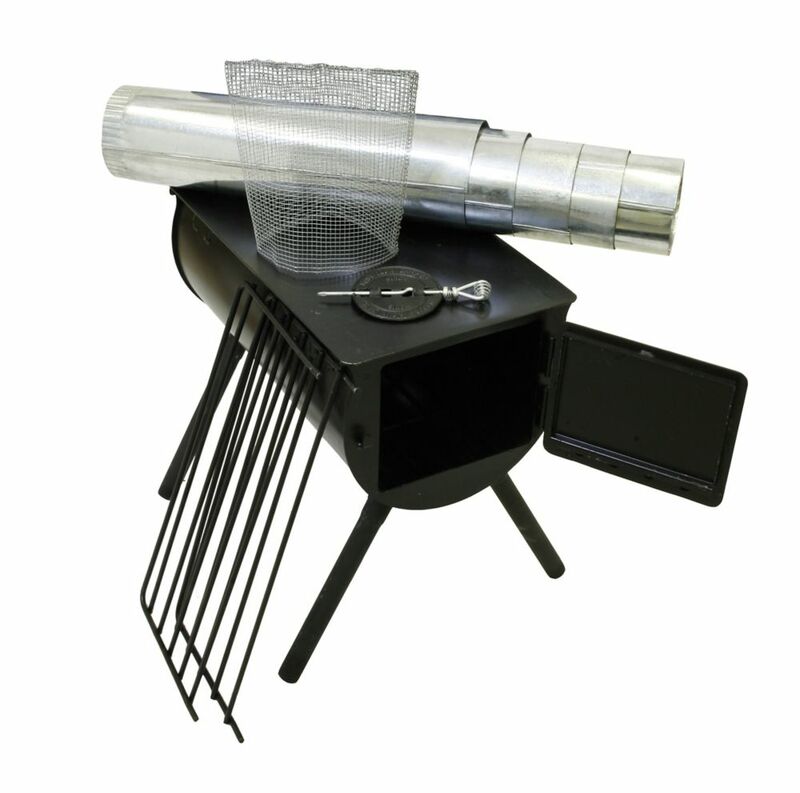 These items in addition to a five piece nesting pipe are included with our Alpine Stove package. Each component is designed to fit inside the stove, along with the removable legs, for easy storage and transport. We have even drilled the hole for you for installing your pipe damper. A roomy cook top and door damper makes it easy to control the heat for cooking chores. If you need more hot water the stove has been designed to take a standard wood stove water heater and it will also nest inside. Alpine Heavy Duty Cylinder Stove is rated 4.5 out of 5 by 28. Rated 4 out of 5 by Floridahoan from Love my tent stove I have the alpine tent stove. I usually use it for hunting and camping in the cold months. It warms my wall tent well. Each year I take the Boy Scouts winter camping. We do all the cooking in the stove, from stew to popcorn. I also place a nice roast in a Dutch oven with carrots and potatoes. It is delicious. I’ve only had one problem with the stove build and that is on the first or second use, the weld on the leg pipe which holds the tightening nut broke. I have been unable to replace or repair it, so one of the legs is loose when moving the stove. Rated 4 out of 5 by Hillgirl from THANK YOU this Alpine Chef stove has made ALL the... THANK YOU this Alpine Chef stove has made ALL the difference in below zero weather conditions at high altitude in Colorado in the last few weeks! It starts well, stovepipes draw well, and it maintains a very nice BTU environment in our late 1800's cottage behind Pikes Peak.We have successfully whistled up teakettle for cocoa and tea, and the rack dried snowy collars in record time. It was not hard to install, and I am loving it!From 7 woodstoves owner - the only stove that out performed this one was the antique pot belly, and it still had a much less cooking area! Rated 5 out of 5 by David from Good amount of heat, maximum log size about 2ft long x 8 inches wide. Heavy steel construction wi... Good amount of heat, maximum log size about 2ft long x 8 inches wide. Heavy steel construction will last a long time.